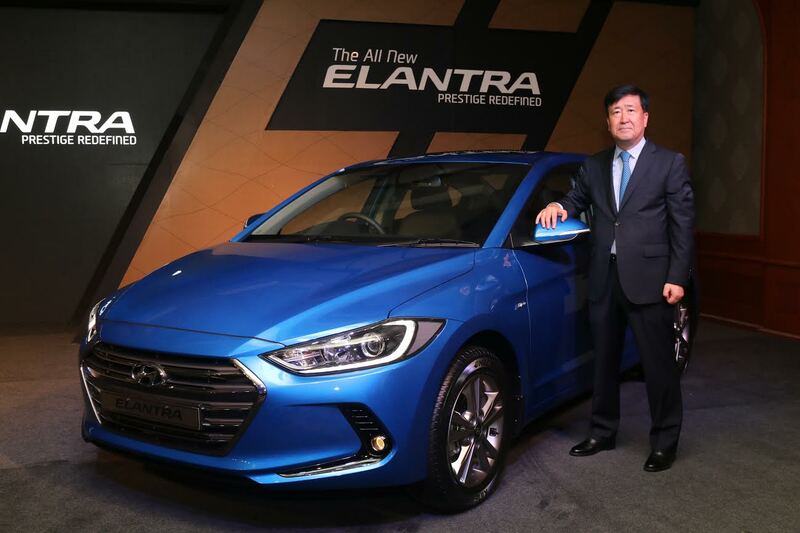 Mumbai, August 24, 2016: Hyundai Motor India Ltd, the country’s leading premium car manufacturer and the largest passenger car exporter, today launched the All New 6th Generation Elantra, which redefines prestige in its class. All Round Excellence and Great Experience are some of the Expressions that are associated with the All New Elantra, which has establishes it as the most popular model globally. The development team associated with the creation of the All New Elantra has conquered the tough challenge of creating a model which could live-up to this reputation and deliver unmatched value. For this, after taking feedback from numerous customers globally, A Completely New Vehicle Platform was created with Safety & Performance as highest priority. The exterior styling of All New Elantra is Bold, Modern and Futuristic. The design evolution encourages dynamic expression and projects sportiness with sense of stability. The front is defined by Hyundai’s signature chrome hexagonal grille that projects bold and distinctive character. While the sleek HID headlamps together with LED light guides gives a sharp and futuristic look. The side profile is designed with a sence of sporty & coupe like silhouette while the rear is extremely impactful with eye catching split type LED Tail lamps. Aerodynamic profile of the car along with innovative wheel air curtain and other advance design package technologies have resulted in Best-in-Class drag coefficient of 0.29. · The Driver-centric Horizontal crash pad layout with T shaped center fascia and a subtle tilt towards driver's seat ensures minimal driver movement for comfortable and safe driving. · Ergonomically designed steering wheel controls for Audio, Cruise and Voice control provides enhanced comfort during long drives. Hyundai's renowned and proven 1.6L U2 Common Rail Technology diesel engine offers powerful performance with low NVH, high fuel efficiency and durability. Driving pleasure within the city and highway is ensured by the variable geometry turbocharger for low and high end torque. The chassis structure is developed to give stability and actual mileage improvement during high-speed driving. In-house developed 6-Speed Manual and 6-Speed Automatic Transmission offer superb smoothness and better fuel efficiency. The 2nd Generation 6- Speed Petrol AT is more refined with reduced frictional losses. The First-in-Segment 'DRIVE MODE select’ feature gives an option to the driver to choose between 'ECO Mode'-for higher fuel efficiency or 'SPORT Mode' for enthralling performance at the press of a button. The All New Elantra features advanced infotainment system with 8.0 High Definition capacitive touch screen- Audio Video Navigation System (AVN) with rear view camera is for improved driver visibility and functionality. Multimedia system is equipped withApple Carplay and Android Auto for seamless integration of app based navigation, streaming audio, voice controlled search capabilities and smartphone applications. For the first time, All New Elantra comes with 6 speakers along with SMART SURROUND SYSTEM by 'Arkamys’ delivering a music experience much closer to the artists original intent. Hyundai vision is to be the Life time partner of its customers. We are always around and near to our customers. As a unique customer Assurance initiate, Hyundai has introduced Hyundai Premium Assurance Program (HPAP) offering Best-in-Class warranty with 3 Years Unlimited Kilometers for all the customers of All New Elantra. The program also offers Free Maintenance for 3 Years/30,000 kilometres, 3 years Roadside Assistance, 3 times update on ‘Map Care’ and 3 times Customer 'Home Visit'. As a goodwill gesture to Hyundai Loyal Customers additional 4th Year Extended Warranty will be offered. The All New Elantra will be available in 9 variants with 5 exterior colour options. The Elantra was first introduced more than 26 years ago and has sold more than 11.5 million units till date. It has won numerous awards and accolades including ‘2012 North American Car of the Year’, ‘2012 South African Car of the Year’ and ‘Highest ranked in compact car segment for initial quality’ in 2014 by J.D. Power and Associates. The 6th Generation All New Elantra has won prestigious awards globally including Top Safety Pick+ Rating from Insurance Institute for Highway Safety (IIHS) in July 2016, 2016International Design Excellence (IDEA®) Bronze, iF Design (Germany), Biggest Bang for the Buck, Vincentric Cost of Ownership Award (US), Autobest in Europe, and was named as National Car of the year in South Africa and Canada. Each of the previous five generations of the car have contributed to its rising popularity and today it remains one of Hyundai Motor’s best-selling models.